Together with Kamishi Swimming School we prepared a wonderful set of dryland exercises for swimmers that they usually provide to their BREASTSTROKE swimmers. It is a selection of exercises from Swimming Anatomy book by Ian McLeod. All of them you can do at the GYM. This exercise is good for every type of stroke, but especially for breaststroke. It mimics the final portion of the underwater pull performed off the start and each turn wall. “In the starting position your hands are at your midline. As the elbows are extended, the hands pull the ends of the ropes outward so that when the elbows are almost locked the hands are shoulder-width apart”. This exercise also enhances the second half of the pull phase during breaststroke. 1 . Grasp the bar using an underhand grip. Your hands should be spaced shoulder-width apart. 2 . 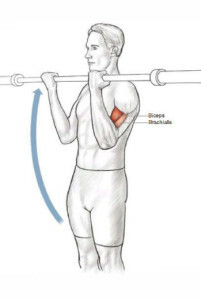 Without leaning back, curl the bar toward your chest in an arc until the bar is level with your shoulders. 3. 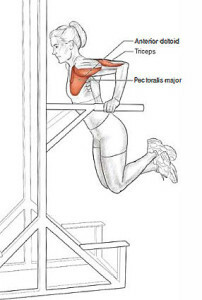 Return the bar to its start position at arm’s length. 1. Facedown, support your body weight on your toes and forearms. 2. 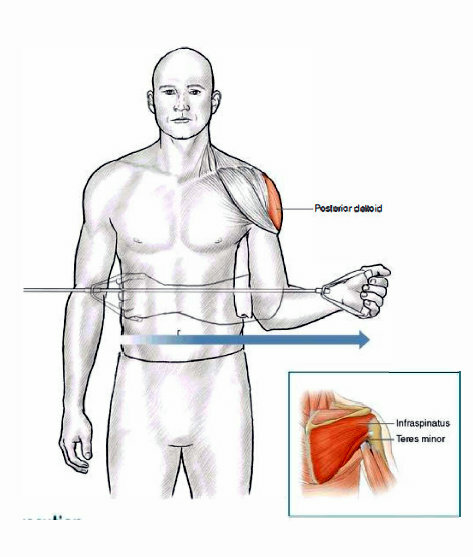 Holding your body in a straight line, lower your chest while maintaining the shoulder position and allowing your shoulder blades to pinch together. 3. 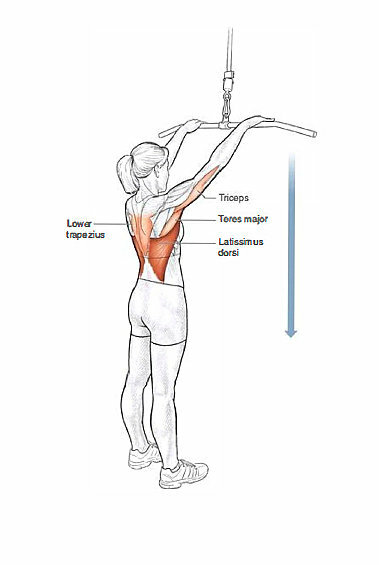 By rolling your shoulders (protraction), push your upper body upward. 1. Stand sideways 4 feet ( 1 20 cm) from a pole with a piece of exercise tubing attached at elbow height. 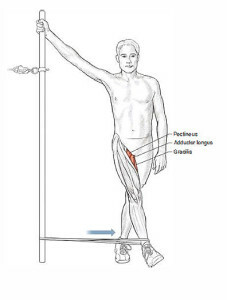 Hold the tubing in the hand farther from the pole and bend the elbow to go degrees. 2. Rotate your hand away from your torso until you have covered a gO-degree arc. Keep your forearm parallel to the floor during the entire movement. 1. Position yourself on a dip bar. Support your body weight with your elbows almost locked. 2. While lowering your chest downward, lean your upper body forward. 3. 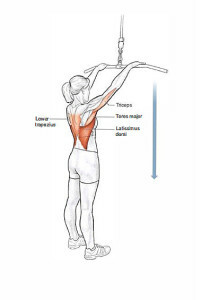 Stop when your upper arms are parallel to the floor or when you feel a stretch in the front part of the shoulders. 4. Push yourself upward until your elbows are almost locked. “Breaststrokers will find this exercise particularly beneficial because it is similar to the underwater pull that is performed off the start and each turn wall. 1. Using both hands, lift the medicine ball up over your head. 2. 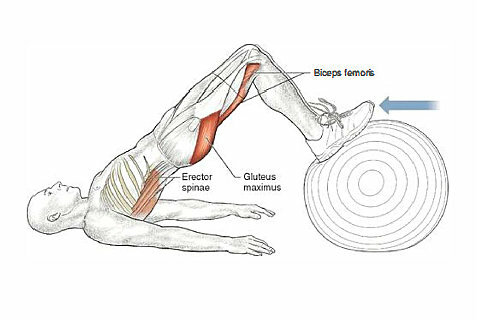 Forcefully throw the medicine ball downward, targeting a spot on the ground 1 foot (30 cm) in front of your feet. 3. Catch the medicine ball as it bounces up off the ground. 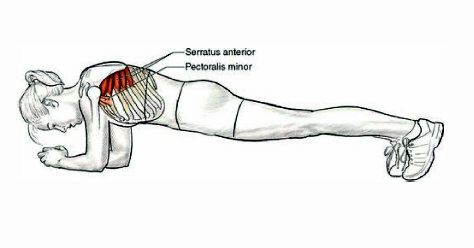 “Because it starts with the arms and trunk in an elongated and stretched position, this exercise helps swimmers develop confidence and strength in their stroke during the initial portion of the pulling phase of all four strokes. 1. Position yourself so that when you are kneeling, the high pulley is diagonally behind your shoulder. 2. Reaching up and back, grasp the handle with both hands. 3. Initiate the movement with your abdominal muscles. The arms should act as an extension of the torso. 4.Using an arcing movement, guide the handle downward toward the opposite knee. “To get the maximum benefit out of performing this exercise, you must stabilize the spine in a neutral position for the entire time. 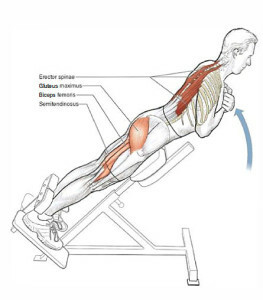 Additionally, the exercise targets the abdominal muscles in a way that will carry over to strengthening the undulating body movements that occur during breaststroke and butterfly. 1. Using your forearms, support your upper body on a physioball. Support your lower body with your knees and toes. 2. Set your abdominal muscles to stabilize your spine in a neutral position. 3. Roll the ball out slowly, allowing your arms to move with the ball and your knees to straighten. 1. Stand facing the pulley machine. Using an overhand grip, position your hands slightly wider than the width of your shoulders. 2. 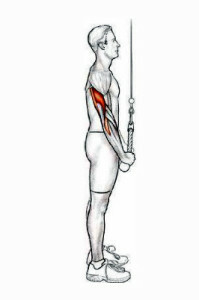 Holding your elbows in 30 degrees of flexion, pull the bar down to your thighs in an arcing motion. “Breaststroke swimmers will benefit through strengthening of the undulating or wavelike body movements that are integral to their movement through the water. 1. Lie facedown, position the bolster just below your hips, and secure your ankles. 2. From a hanging position, raise your torso until your legs and upper body are in a straight line. “This exercise targets a select group of muscles that are responsible for internal rotation of the hips, a movement that is primarily seen in swimming during the recovery phase of the breaststroke kick as the heels are brought toward the buttocks. Breaststrokers will therefore benefit most from the exercise. But other swimmers should not ignore the exercise, because a small rotational component takes place during the other strokes. 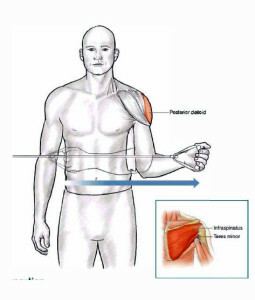 Like the rotator cuff muscles of the shoulder, these muscles play a protective role and help stabilize the hip joint. 1. Standing on one leg, reach with your arms and trunk to the inner side of the weight-bearing foot. 2. Use the weight-bearing leg as a pivot point. 3. Reach your arms and trunk toward a point on the ceiling above and slightly behind the same shoulder. “Breaststrokers who want to strengthen their hamstrings will find this a useful exercise. This exercise is also valuable because it targets the hamstrings, gluteus maximus, and erector spinae, which contribute to holding a tight streamlined position. 1. Lie on your back and position a physioball under your heels. 2. 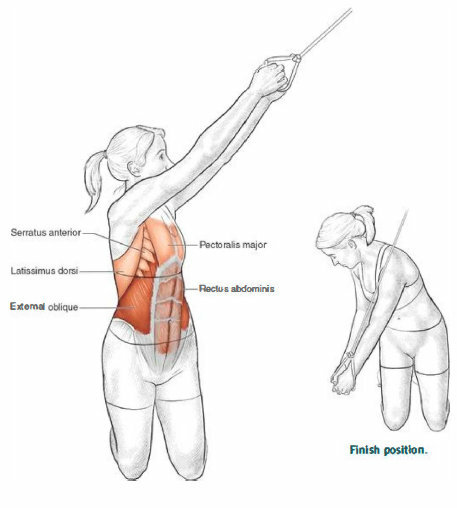 Tighten your core muscles and lift your hips toward the ceiling. 3. Without letting your hips drop, pull your heels toward your buttocks. “Avoid lifting the hips off the bench when performing the exercise. Perform the movements in a slow, controlled fashion. Do not try to kick the roller pads toward your buttocks; pull them instead. 1. Lie facedown on a hamstring curl machine and hook your heels under the roller pads. 2. Pull your heels toward your buttocks in an arcing motion. “Direct targeting of the adductor muscle group can help the breaststroker increase the strength and stamina of the kick. 1. 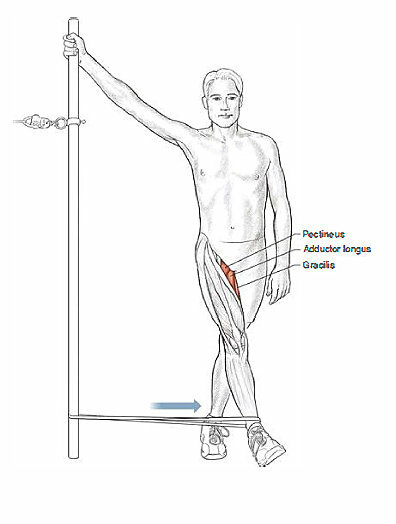 Stand sideways to a backstroke flagpole with a band fixed to the pole and the ankle closer to the pole. 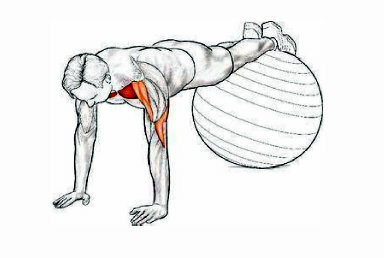 Tighten your core muscles to stabilize your hips. 2. Allow the resistance of the band to pull your leg out to the side. 3. Keeping your knee straight, pull your leg across and in front of the stabilizing leg. How many sets and reps should I do for each exercise? Lunges! Lunges are one of the easiest ways to strengthen the musculature around the knee and help prevent those weak knees from becoming sucseptible to injury. And the best part about them is that they don’t require any equipment. Previous PostWhy do people give up? Next PostКак покупать и продавать недвижимость на этапе строительства в Швеции?